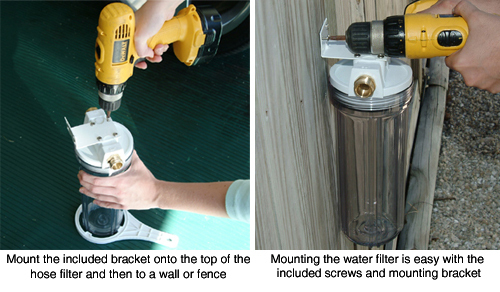 Get the Clear Inline Hose Filter Canister and all its accessories in one comprehensive package! 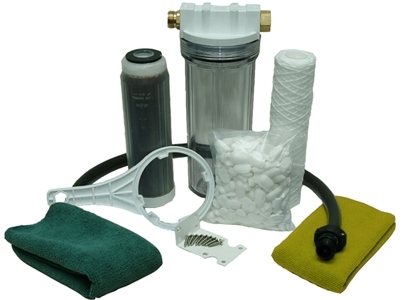 The Total Filter Kit includes everything you need for a one-step, in-line filtration system. Unfiltered water from an outdoor spigot can contain a number of things you wouldn’t knowingly put on your vehicle. Yet, without any type of filtration system, you are washing your vehicle in unclean water. Both city water and well water contain minerals and sediment. Minerals cause water spots. Sediment is responsible for micro-marring. Even if you take every possible precaution to protect your vehicle’s paint from swirls and water spots, you’re still leaving it completely vulnerable if you don’t have a water filter. Minerals, particularly calcium and magnesium, are what constitute “hard water”. Hard water is responsible for water spots, poor-lathering shampoo, and that green ring around your bathtub. The calcium and magnesium actually harden inside pipes (called “scale”) and on other surfaces, including your vehicle. When you rinse with hard water, you could be dousing your vehicle with hard mineral deposits. The only way to prevent hard water deposits is with a water softener. The Total Filter Kit makes owning an in-line filter practical for the hobbyist. There’s no guesswork. When you receive the kit, simply connect the included 2 ft hose to the spigot and the hose adapter labeled “in” on the filter unit. Connect your standard Inline hose to the “out” side of the filter. Insert either of the included cartridges, screw the base back onto the lid and start washing. 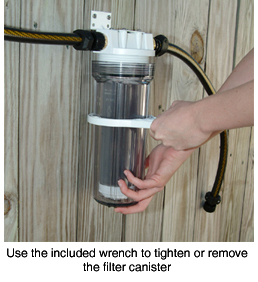 Keep your wash water perfectly clean with this easy-to-install, in-line hose filter. It installs between two hoses to filter sediment out of the water or to soften the water, depending on which cartridge you insert. Brass hose-adapter fittings ensure long-lasting performance. 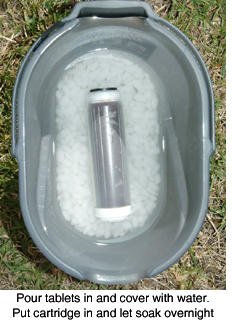 The sturdy plastic canister allows you to see when the sediment filter needs changing. The entire unit is 12 inches tall and about 4 ½ inches at its widest point. It includes a wrench to assist in changing the cartridges and a mounting bracket. This cartridge is made of five micron spun poly. It traps fine sediment as the water passes through so that nothing hits your vehicle but pure water. Sediment may include sand, rust, and hard water scale. If you don’t have a hard water problem, this cartridge is all you need to filter your water. A water softener works by replacing the calcium and magnesium ions with sodium ions. Sodium ions are “soft”. They don’t produce scale and they don’t stain. They change the actual texture of the water, making it feel “slippery”. This causes water to sheet off the vehicle more effectively. Water that remains on the vehicle will not leave spots. Installation of one Clear Inline Hose Filter Canister requires two hoses. Insert the 3 ft. hose between the spigot and the filter. This small hose makes the installation look neat and tidy because there’s no long hose to coil up. 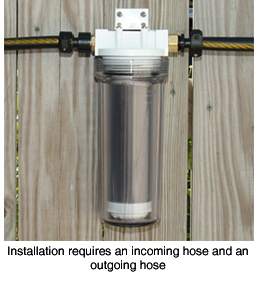 From the filter, connect your regular hose to complete installation. Regenerate your water softener cartridge with these tablets. To use, pour the tablets into a plastic dishpan or bucket; use enough to cover the bottom of the pan. Cover the tablets with water. Put the softener cartridge in the water and let it soak overnight at least. The tablets will dislodge the calcium buildup on the resin and replace it with sodium. Replace the cartridge in the filter unit and it will be almost as good as new. Cobra Microfiber Towel is spun from an 80/20 polyester/polymide blend, producing a highly refined microfiber. The microscopic polyester/polymide fibers are split with a unique process that creates a “feathered” weave, rather than the more common “hook” texture of most microfiber cloths. This superior “feather” weave results in far greater absorption properties in a virtually lint free network of fibers. The Total Filter Kit is your solution to water spots and micro-marring produced during washing. Remember, if you’re washing your vehicle with unfiltered water, you could unknowingly be pouring hard water scale or sediment on the paint finish. This simple, in-line filtration system is an easy way to eliminate the threat of unclean wash water. A total retail value of $97.95. Save $17.96! Autogeeks World Class customer service has kept me a more than satisfied customer for about 2 years. Kudos to the entire Autogeek team! !